In the case of most characters in cinema, audiences don’t really need to see them mature to understand the full magnitude of their personality. We accept them for who they show us they are when we’re first introduced. We didn’t really need to see Indiana Jones as a young boy to know where his adventurous spirit came from, but it certainly rounds out the portrayal. Heck, probably no one wanted to see The Muppet Babies before they actually did and it became something people adored. Same goes for Han Solo. Movie-going masses have always accepted him as the loveably arrogant rascal from a galaxy far, far away. While elaborating on this beloved character wasn’t ever a necessity, the filmmakers involved in SOLO: A STAR WARS STORY definitely make it a worthwhile, highly entertaining ride. Absolutely stunning in design, this immersive, unabashedly fun, thrill-a-minute adventure delivers on the promise of compelling characters, beautiful aesthetics and spectacular action. One thing screenwriters Jonathan Kasdan and Lawrence Kasdan have a clear grasp of is their titular character. 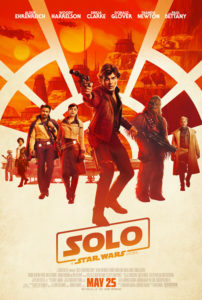 Instead of making this a stereotypical, predictable journey for young Han (Alden Ehrenreich), morphing from antihero to hero, they show a character who’s repeatedly confronted with life’s moral ambiguities. It doesn’t undo any of the mythos surrounding his well-defined character – it serves to augment the lore. As we come to find out, Han’s always been a street-smart scoundrel. His greater purpose will lead him to hooking up with a band of rogues – led by Tobias Beckett (Woody Harrelson) – and finding series stalwarts like Chewbacca (played by Joonas Suotamo) and Lando Calrissian (charisma factory Donald Glover). Also interwoven is a noir-influenced narrative involving femme fatale Qi’ra (Emilia Clarke) and the wealthy, irascible Dryden Vos (Paul Bettany). 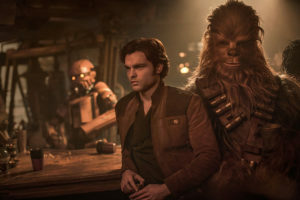 Alden Ehrenreich and Joonas Suotamo in SOLO: A STAR WARS STORY. Courtesy of Lucasfilm. Lucasfilm has tried this tactic before with the “Anakin/ Darth Vader: Origins” prequels, albeit to a disastrous degree, but the powers that be have since learned their lessons on what ingredients should be part of their iconic character’s fundamental history. Audiences who say they don’t care will quickly see that the fun here is in discovering why you should. It gets you to care about Han’s first interpersonal relationships and the building blocks that made those characters so darn endearing as their mature selves. The narrative also feels cohesive. It’s so self-assured, its genre identity bends from noir, to western, to heist, to caper, all within the confines of an established fantasy/ sci-fi realm. Plus, aligning with all the other STAR WARS films, the breakout star is still the droid – in this case, the kickass L3-37 (Phoebe Waller-Bridge). Fan service moments are, of course, inevitable with a corporate product like this. That said, at least the creatives actually get creative with what to use, when. It never overtakes the scenes or gets in the way of character arcs either. We aren’t ahead of the mechanics of how director Ron Howard and Co. work these revered references into the story. From the obvious to the innocuous, these stingers complement the action. There’s even some fun Easter Eggs sprinkled throughout (hint: Vos’ trophy table displays a prominent one). Not only is the story fairly solid, Howard’s film has awesome aesthetic kick. Bradford Young’s cinematography is awe-inducing. The expansive vistas of this otherworldly adventure are eye-popping and breathtaking to behold. There are quite a few “hit the pause button on the blu-ray” moments credited to his expertise. The imagery transcends – everything from Han seeing the Millennium Falcon for the first time, to the chiaroscuro light narrowing on Qi’ra’s eyes, to the dangerous beauty of the snow-covered mountains and dry, desert terrain. He and Howard even play around with the ever popular yellow/ blue color theory within the confines of Neil Lamont’s exquisite production design, which further captures the imagination. Adding to the cinematic texture are the tactile, clean-lines of David Crossman and Glyn Dillon’s costume designs. There’s not a cape to be found you wouldn’t want to wear. The hair and makeup departments also earn top marks for their impeccably suave work. Joonas Suotamo, Woody Harrelson, Emilia Clarke and Alden Ehrenreich in SOLO: A STAR WARS STORY. Courtesy of Lucasfilm. It’s not all perfect, though: Despite feminism running a bit stronger here than in other modern incarnations, one badass female character unnecessarily sacrifices herself for a man’s arc. There are a few lulls as far as pacing goes – specifically when it transitions from the end of act two (which ends on a banner set piece) to act three. It’s also very light on deeper dramatic stakes. Missing is the fiber in this cinematic caloric intake. While it’s fun to see them assemble their crew, pithy platitudes on finding one’s tribe don’t dig down deep enough. It’s empty calories in that regard. They bring up something, while beloved, from the widely-trashed prequels that leads audiences to question why they’re being reminded of films they hate. It builds a connective tissue between the prequels and the original trilogy, but also leads to a bigger picture, disheartening issue of “the Marvel-ing” of this franchise. Overall, don’t get a bad feeling about this. You may even laugh it up, fuzzball. And if not, then I’ll see you in hell!